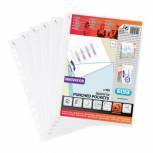 Q-Connect Punched Pockets Polypropylene 50 Micron A4 Clear (Pack of 100) KF24001 Pack of 1 Q-Connect Plastic Punched Pockets, the versatile way to protect your paperwork. 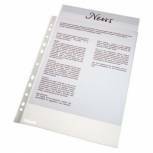 Strong 50 micron polypropylene pockets feature a multipunched reinforced edge which suits most binders. Size: A4. 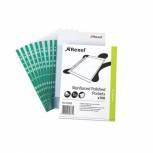 Q-Connect Delux Punched Pocket Top Opening Green Strip A4 Clear (Pack of 100) KF01121 Pack of 1 Q-Connect Deluxe Punched Pockets. 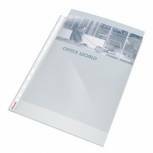 Crystal clear, 65 micron high quality multipunched pockets suitable for most binders. Features, reinforced Green strip edge and top opening. Size: A4. 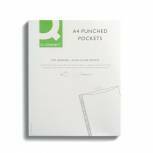 A4 Punched Pockets (Pack of 500) PM22312 Pack of 1 A4 Punched Pockets Light Duty Pk 500 Comes in an easy to use dispenser box. Top opening. Multi-punched. 30 micron. 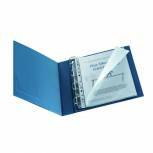 Q-Connect Delux Punched Pocket Top Opening Blue Strip A4 Clear (Pack of 25) KF01122 Pack of 1 Q-Connect Deluxe Punched Pockets. Embossed anti-glare finish, 75 micron high quality multipunched pockets suitable for most binders. Features, reinforced Blue strip edge and top opening. Size: A4. 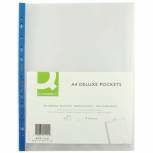 Rexel Pockets Reinforced Polypropylene Clear (Pack of 100) CKP/A4 12265 Pack of 1 Rexel Copyking Pockets CKP/A4. Manufactured from polished anti-static material which helps prevent off-setting from photocopies and duplicated documents. Top opening with a reinforcing strip (Green) to provide extra strength. Size: A4. Q-Connect Expanding Punched Pocket Full Length Front A4(Pack of 5) KF00138 Pack of 1 Q-Connect Expanding Punched Pockets. Multi punched , top opening, durable, gusseted, PVC, 180-micron expanding punched pockets with full length covers. 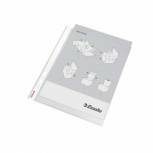 Esselte Pocket Landscape Top Opening Embossed A3 Clear (Pack of 10) 47182 Pack of 1 Heavyweight polypropylene pocket ideal for storing papers in constant use. copy safe material facilitates the long term storage of documents without fear of print uplift. Multi-punched with clear reinforcing strip. A3 landscape. Esselte Economy Pockets Polypropylene Top Opening A4 (Pack of 100) 56133 Pack of 1 Esselte copy safe Pockets. Lightweight top-opening polypropylene pockets with multi-punched White reinforced side strip suitable for use with most binding mechanisms. Lightly embossed to minimise glare and finger marks. Pack of 100. A4. 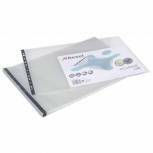 Rexel Ecodesk Recycled Filing Pocket A4 (Pack of 25) 2102242 Pack of 1 Rexel Ecodesk A4 punched pockets made from 100% recycled post consumer waste. Strong 120 micron polypropylene pockets with Black reinforced 11 hole spine. 100% recyclable. 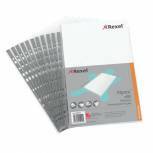 Rexel Expanding Punched Pockets A4 (Pack of 5) 2104223 Pack of 5 Rexel Expanding Punched Pockets A4 Pack of 5 2104223. Holds up to 250 sheets of 80gsm paper. 170 micron PVC. Reinforced multi-punched filing strip. Q-Connect Expanding Punched Pocket 3/4 Length Front A4 (Pack of 5) KF00139 Pack of 1 Q-Connect Expanding Punched Pockets. Multi punched , top opening, durable, gusseted, PVC, 180-micron expanding punched pockets with 3/4 length covers. Elba Expanding Punched Pockets Top Opening A4 (Pack of 10) 100080753 Pack of 1 Expanding Punched Pocket. Clear plastic pockets ideal for filing. Each pocket expands and with a euro-punched spine is suitable for use with most lever arch files and ring binders. 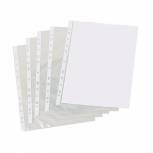 Elba Quick In Punched Pockets A4 Clear (Pack of 100) 400012939 Pack of 1 Elba Quick In Punched Pocket Clear. Heavyweight polypropylene pockets to help protect documents. Multi punched reinforced filing strip. Ideal for filing and keeping documents. 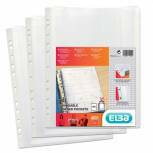 Esselte Pockets Heavy Duty A4 (Pack of 25) 47187 Pack of 1 Heavy duty oversized A4 polypropylene pocket ideal for storing and protecting papers constantly handled. Especially suitable for more industrial environments. Top opening pocket lightly embossed to prevent glare and finger marking. A4 clear. 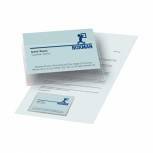 Pelltech Business Card Pockets Top Opening 95x60mm (Pack of 100) PLH10141 Pack of 1 Pelltech Self Adhesive Top-Opening Business Card Pockets. 95x60mm. 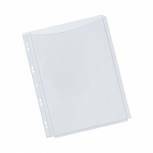 Esselte Pocket Top Opening Embossed A5 Clear (Pack of 25) 47183 Pack of 1 Heavyweight polypropylene pocket ideal for storing papers in constant use. copy safe material facilitates the long term storage of documents without fear of print uplift. Multi-punched with clear reinforced strip. A5 top opening. 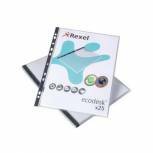 Rexel Ecodesk Recycled Filing Pocket Landscape A3 (Pack of 30) 2102578 Pack of 1 Rexel Eco Recycled Pockets. Manufactured from 100 percent recycled post consumer waste reducing the consumption of unsustainable resources. Features a Black reinforced 11 hole spine. 90 micron. Size - A3. 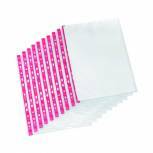 Q-Connect Delux Punched Pocket Side Opening Red Strip A4 (Pack of 25) KF01123 Pack of 1 Q-Connect Deluxe Punched Pockets. 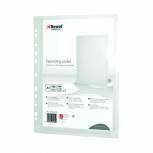 Embossed anti-glare finish, 75 micron high quality multipunched pockets suitable for most binders. Features, reinforced Red strip edge and side opening. Size: A4. 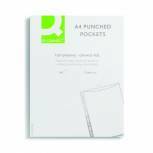 Q-Connect Punched Pocket Polypropylene Top and Left Side Opening A4 (Pack of 25) KF00714 Pack of 1 Q-Connect punched pockets. Top/Left Side-Opening. 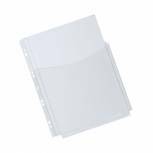 A4 multipunched pockets to fit most types of ring binder, lever arch file etc. 80 micron. Gloss finish. 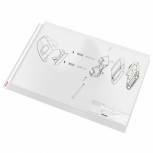 Rexel Nyrex Premium Top Opening Presentation Pocket A4 (Pack of 50) 2001018 Pack of 1 Nyrex Premium Presentation Pockets. High quality pockets with polished finish ensuring extra clarity for those important documents, and the multipunched silver reinforced filing strip adds style and strength.